The area where the S-Cross really impresses is efficiency. The Fiat-sourced 1.6-litre engine provides decent shove thanks to 236 lb ft of torque at 1,750 rpm, but it also enables excellent fuel economy. The engine is linked to a new generation four mode all-wheel drive system. 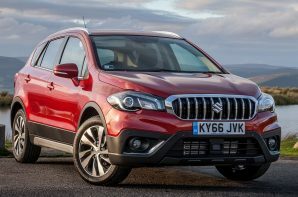 In ‘Auto’ the S-Cross is front wheel drive until grip is lost and then becomes four wheel drive, ‘Sport’ optimises the system to reduce understeer, ‘Snow’ is four-wheel drive by default but allows torque to be moved front and rear as required for traction, whilst ‘Lock’ is designed to get you moving if you do get stuck.